A special thank you to Serra Sabuncuoglu for her vision, dedication and contribution of her curatorial talents and to each of the more than 50 exhibition participants for sharing their thoughtful perspectives on and insights into our community’s unique green, open space — a natural place for our neighborhood to engage with art. 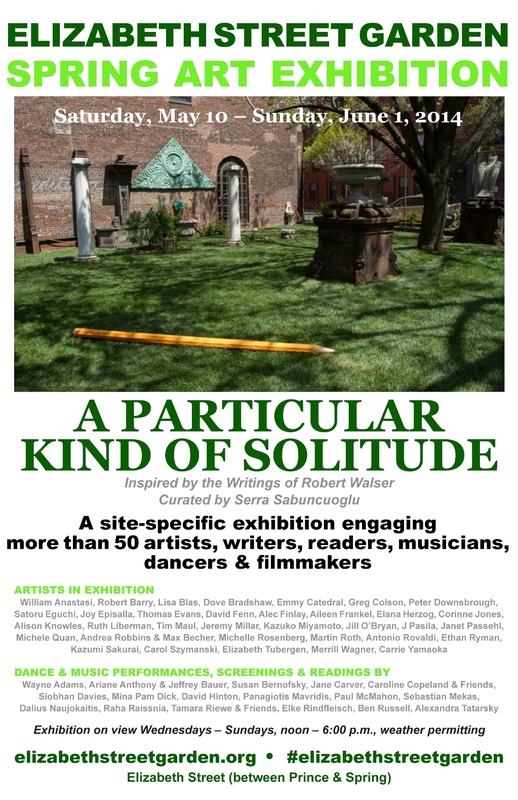 A Particular Kind of Solitude, inspired by the writings of Robert Walser and curated by Serra Sabuncuoglu, was a nearly month-long, site-specific exhibition engaging more than 50 artists, writers, readers, musicians, dancers and filmmakers. The early twentieth-century Swiss author has become something of a hero, or anti-hero for writers and artists over the last few decades. Much of his work and philosophies rest on the quiet magic and personal fulfillment of walking; the urban experience is full of such walks, and this is often how people discover Elizabeth Street Garden. Saturday & Sunday, May 10 & 11, 3:00 – 7:00 p.m.
Elizabeth Street Garden encourages drifting and contemplation, a reprieve from our hectic structured lives. A rare gem with relics from another time and place, with an undetermined future in an ever changing city. While artists make objects and put more physical things out in the world to comment on the complexities of human existence, Robert Walser’s sublime reflections of walks in parks reveal the Garden’s purpose for city dwellers and provides us a frame to contemplate the work we make and observe in this outdoor setting. I call upon my fellow artists, writers and performers to carry on a dialogue with Walser’s writings and engage with the unique environment of the Garden. I invite the community and passersby to join us as we gather together in this enchanting setting to celebrate Walserʼs appreciation for nature and the surrounding landscape. Serra Sabuncuoglu is an artist and curator who orchestrates independent curatorial projects in offbeat and unusual spaces around the city. She has volunteered with Elizabeth Street Garden since 2013 and organized this outdoor exhibition to bring awareness to the site by engaging contemporary artists, writers and performers. To preserve Elizabeth Street Garden as a unique public green, open space and NYC Park. Why is the Garden is important to our community? Nighbors and local business owners tell us why. Sign up now! Help save the Garden.